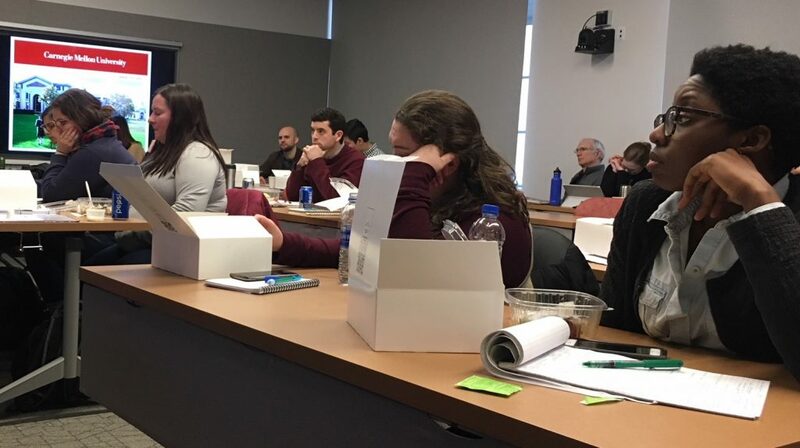 On February 3rd and 4th, CMU students from a variety of colleges and disciplines gathered to learn about the impact of autonomous vehicles in the City of Pittsburgh. The weekend course was strongly supported by Mobility21 University Transportation Center (UTC) staff and faculty, and well attended by UTC student leadership. Over the weekend, students were instructed to prepare a presentation and report to the Mayor on the impacts autonomous vehicles might have on the future of Pittsburgh’s Central Business District (CBD). The final products will be used to inform policy makers on what challenges they will face, and the research that should be done to ensure a sustainable and equitable CBD. Students heard from experts in transportation, disruptive technology, and infrastructure. To prepare for the class, students studied pre-work materials from UTC Director Raj Rajkumar. Speakers throughout the weekend included UTC Executive Director Stan Caldwall, UTC researcher and Director of Mobility Data Analytics Center Sean Qian, and UTC researcher Costas Samaras. 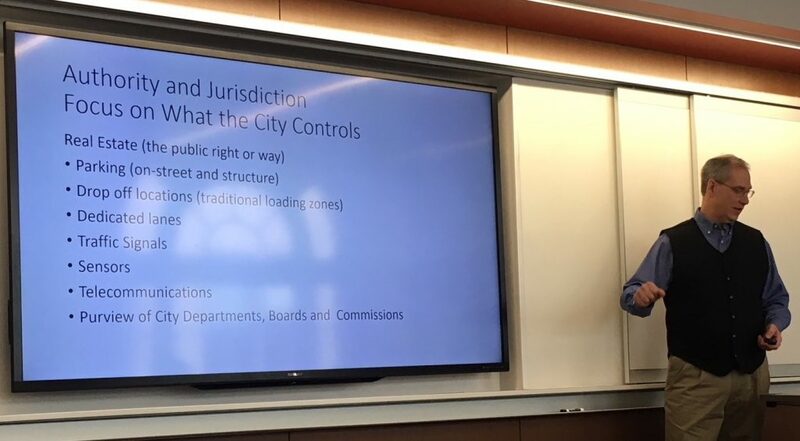 Heinz College Alumnus Alex Pazuchanics, a Smart City Challenge leader from the City’s Department of Mobility and Infrastructure, informed students of challenges specific to the Pittsburgh CBD. Facilitators included former Secretary of the Department of Transportation Al Biehler, and UTC/Mobility21 faculty and Smart City Challenge leader Don Carter. In attendance were four UTC student leaders – Ph.D. students Allanté Whitmore and Matthew Battifrano, and Heinz graduate students Ngani Ndimbie and Amanda Johnson. Students worked with speakers and facilitators to learn more about the impact of autonomous vehicles, interact with real-world policy makers, and determine policy interventions that may be a model for other mayors and other cities. 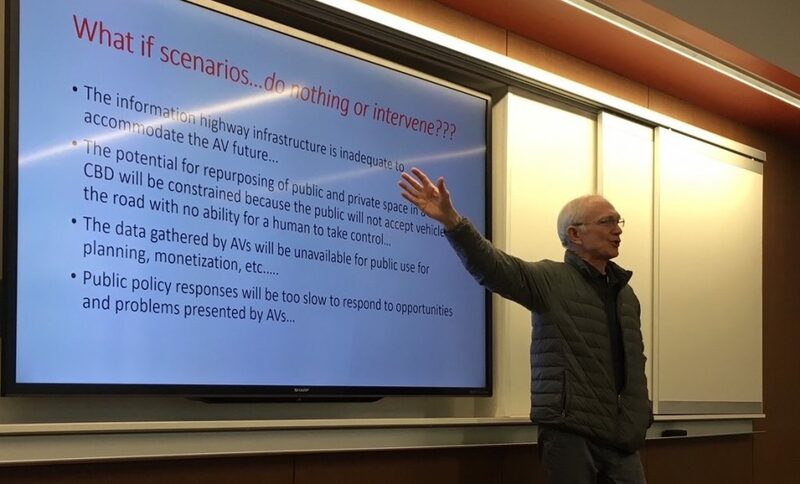 UTC faculty, staff, and students were integral in this effort in ensuring that Carnegie Mellon students are well-informed about the societal consequences of autonomous vehicles.